SM 81: アローラの若き炎！ロイヤルサトシ誕生！！/Alola no wakaki honō! Royal Satoshi tanjō! !/The Young Flame of Alola! The Birth of Royal Satoshi!! New episode title(s) has/have been added to the database. Title: アローラの若き炎！ロイヤルサトシ誕生！！ / Alola no wakaki honō! Royal Satoshi tanjō!! / The Young Flame of Alola! The Birth of Royal Satoshi!!. Please comment below! Re: SM 81: アローラの若き炎！ロイヤルサトシ誕生！！/Alola no wakaki honō! Royal Satoshi tanjō! !/The Young Flame of Alola! The Birth of Royal Satoshi!! 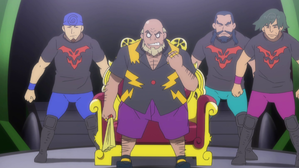 Satoshi has ended up going to see one of the Royal Mask's matches with his friends from the Pokémon School. But as soon as the match starts, the Royal Mask's Gaogaen ends up in severe trouble due to the opponent's dirty attacks. And Satoshi's Nyaheat isn't able to just sit there and watch, and barges into the ring?! Satoshi ends up fighting alongside the Royal Mask as his partner "Royal Satoshi". Can the Royal Mask and Satoshi seize victory? !